I wanted to share a recent letter from our email bag. Bill needed some help coming up with a few creative ideas for his new cottage garden project. He is trying to pull together a little cottage garden complete with raised beds and a Victorian style chicken coop, where an old above ground swimming pool used to be. As I share with Bill, I hope a few of these ideas will also give you the creative boost that you need to get started on your own garden projects! I enjoyed seeing the display of boxes. I have made a couple of Halloween boxes out of cigar boxes. They were appreciated. We have a church auction in October and I plan to make more boxes. Help me out here….I have an 8′ x 10′ garden shed that has been used for chickens and is currently occupied by rabbits. 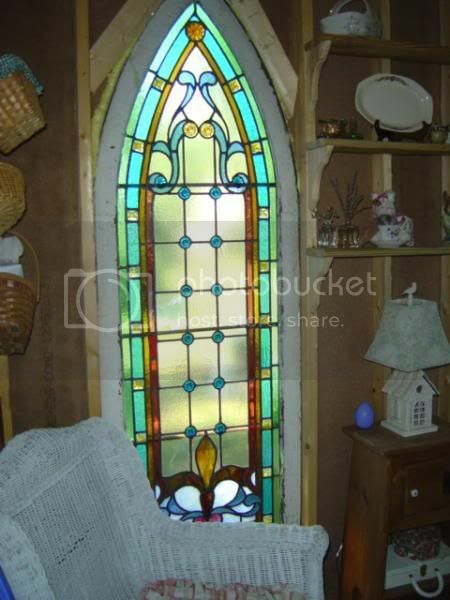 I would like to re-paint it and decorate it in a Victorian style. We recently removed an 18′ round above ground pool from the yard. I am making two 4′ x 8′ raised beds to put in this area, and I will also be using some wrought iron type fencing with it. Any decorating ideas would be appreciated. When you’re starting from scratch, you have so many wonderful options! You could do just about anything you can imagine to your little building! 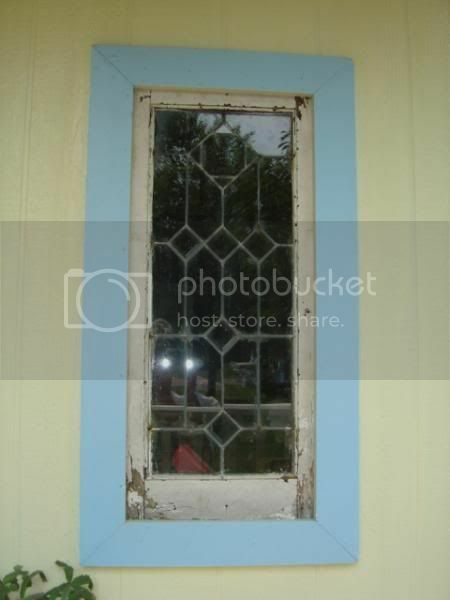 Put in a few stained glass windows – or paint the current windows with glass paint to look like stained glass windows… you can’t tell the difference from a short distance! Don’t let the fear of the “expected price tag” keep you from getting started with this wonderful project! Many times, you will be able to get these elements for free or very low cost if you think creatively! – Construction sites, they will usually let you have discarded items free! 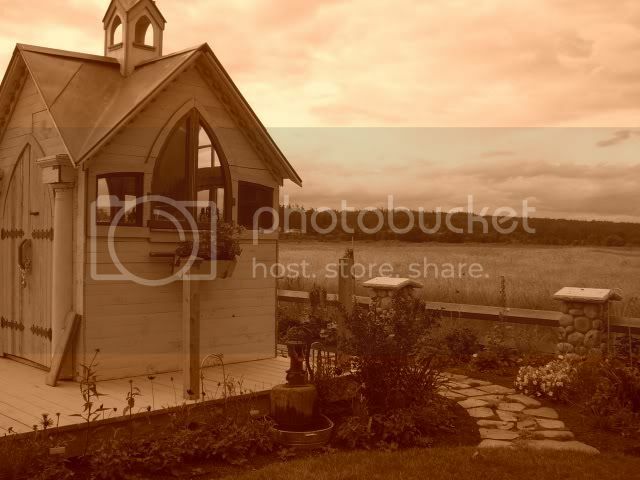 Here are some more beautiful pictures of Garden Sheds to give you even some more ideas! 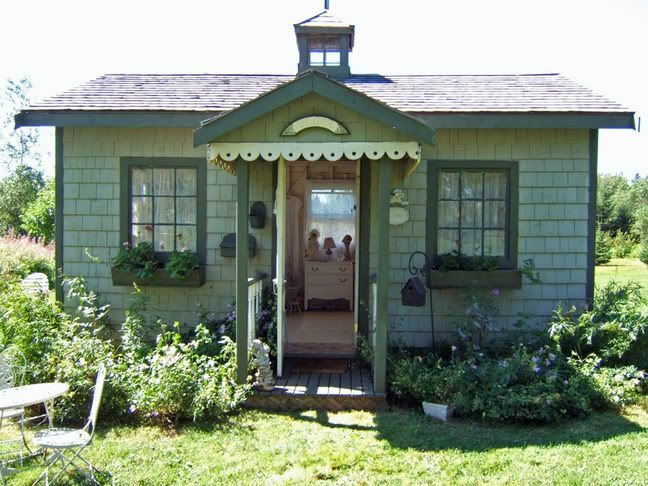 Here is a very tiny house (used as a light in the cottage garden), that you can quickly gather ideas from. Thank you so much for the ideas for a shed. 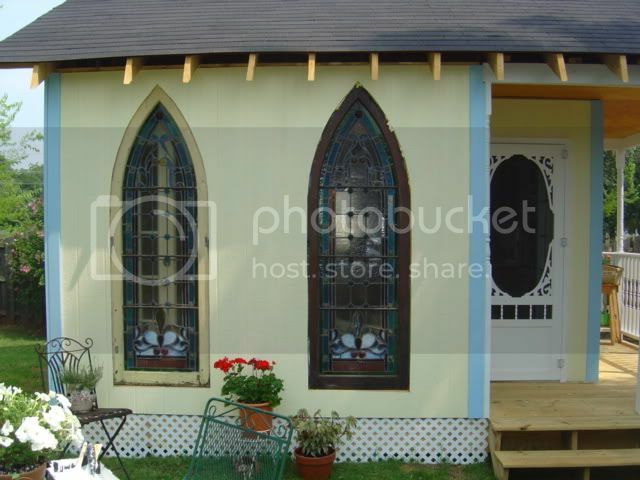 I have a little shed right by my mobil home and I have several old windows. I plan to use the idea of making it look like my shed has windows. I also like the idea of putting gingerbraed trim up. Sounds like a wonderful idea! Send us some before & after pictures! 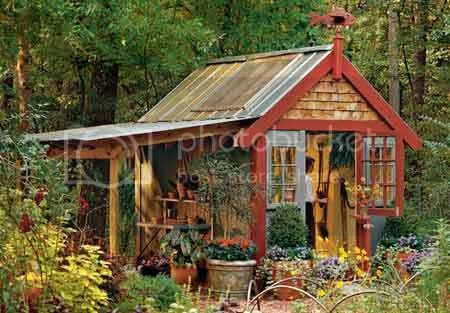 What a great idea than to transform a simple garden shed into a decorative cottage from the outside. 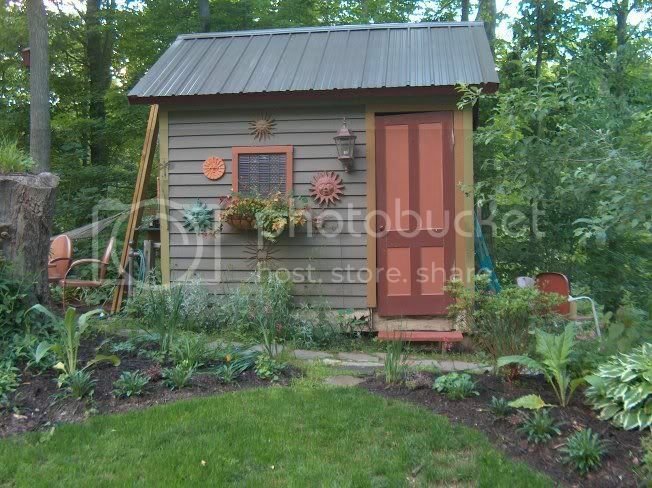 I know many people who also took a playhouse and transformed it into a garden shed or greenhouse after the kids grew up. Thanks for the great inspiration! 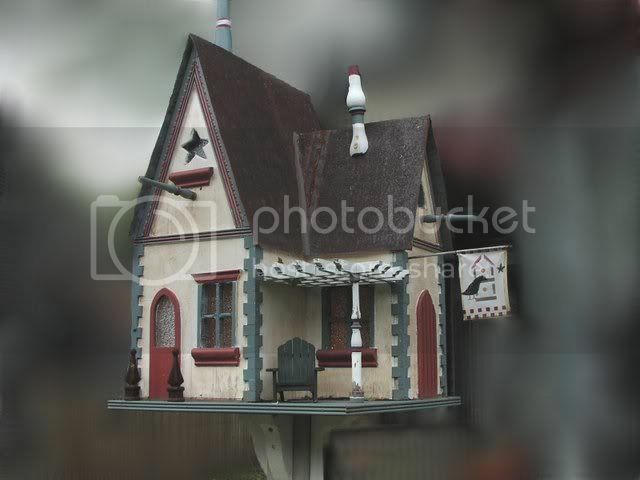 Yes… “playhouses” for big people! I think I want a play house!!! Wow!!! I am full of inspirations…. Beautiful pictures, each containing some elements we may be interested in. One of the realities I have to deal with, is that ducks and chickens wreck havoc with plants. Hanging flower boxes would be possible. My wife and I both like the white barn door on the side. We could paint a door and frame it to give some dimension. I guess I asked the right for ideas. Thanks for your time and ideas. When we are finished….do you ever finish a project like this? I would like to send you some pictures. We are installing some “faux” wrought fences around some of the area (bought them from Lowes). To protect the plants in the raised beds, we are using pvc pipe and netting (ducks and chickens). In the colder weather, I will use plastic and probably be able to continue to grow lettuce, spinach, etc all winter!!! Right now, the raised bed we have started on looks like a Conestoga Wagon. Oh, this is fun! We live in suburbia so we don’t have a great deal of land or a large garden or pets for that matter. I had a playhouse in my backyard when I was kid. I still kind of desire a little cottage in the back just to escape to and read or do some writing. What great ideas you offer here! Wow! I`m so amazed with your blog! It`s truly one of the best that i`ve stumble across. So as I`m new to blogland I was wondering if you would give me permission to add you to my favorites! Those little houses are so cute. They look like something out of a fairytale. These don’t look like sheds at all. They’re beautiful additions that enhance the gardens that they’re in. Love it! Those are just bursting with charm. I love them! These sheds are great. 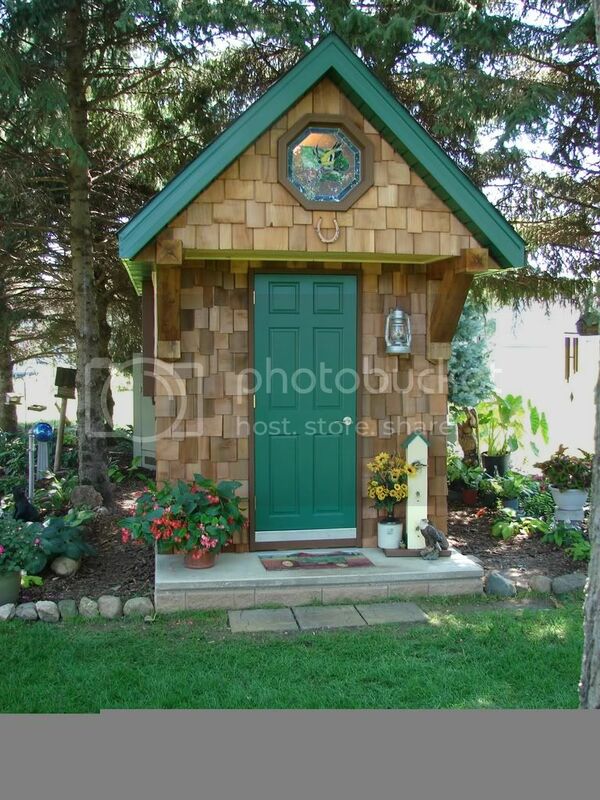 I have just started working on my back yard and decided to make the shed a focal point since it looked like a little cottage. So far I’ve painted mine lilac with plum trim and sage for the door and shutters. The flower bed my son and I put in around it has a color theme of pink, white and yellow. I still have a way to go on making it just they way I want, but these pictures were great inspirations. I love all of these sheds! Makes me want to do something to mine. Wonderful advice and wonderful garden sheds. I’ve been wanting dear hubby to put one up in the garden for awhile now. Perhaps …I’ll show him some of your photo’s to inspire him. Thank you! soooo which one is yours:) Nice photos and good ideas thank your for sharing. This is a fab post – totally inspiring – I can’t wait to have a garden big enough for a shed like this.. Will be a regular reader from now on! Can’t wait to see pictures of the finished item! GREAT post!!! My hubbie built a darling playhouse for our daughters not too long ago and I have as much fun in it as they do!!! 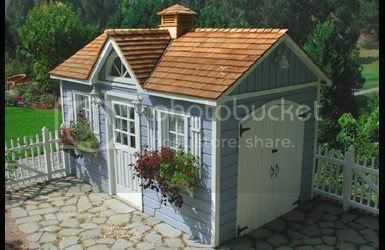 There are a couple of these sheds I would like to live in! These are absolutely beautiful. 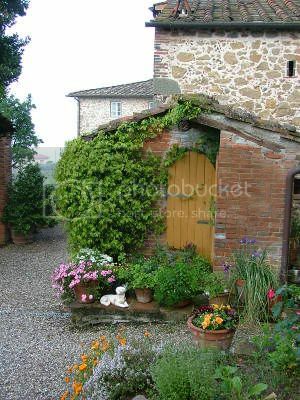 I love the cottage feel in a garden its just so peaceful to me, not to mention homey. 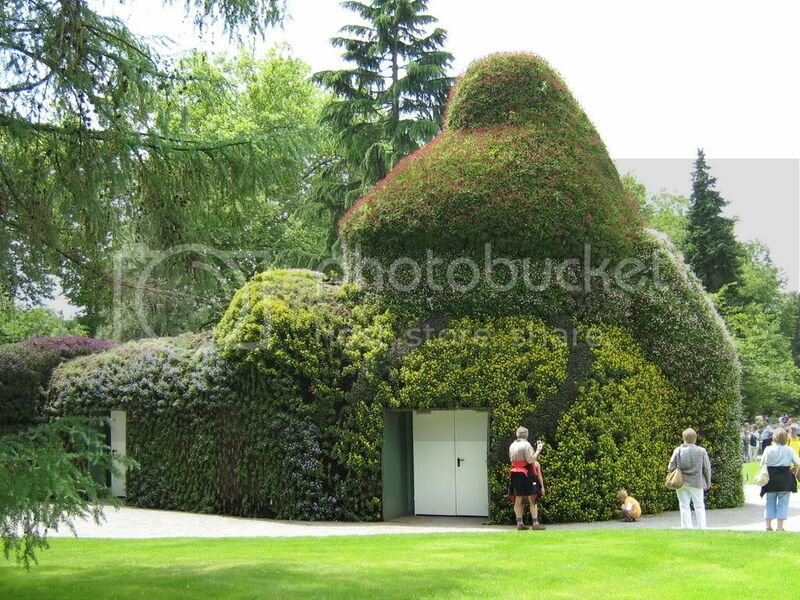 I loved the last picture with the garden shed covered in shrubbery. Hey there! Someone in my Facebook group shared this site with us so I came to check it out. I’m definitely loving the information. I’m bookmarking and will be tweeting this to my followers! Fantastic blog and fantastic design and style.